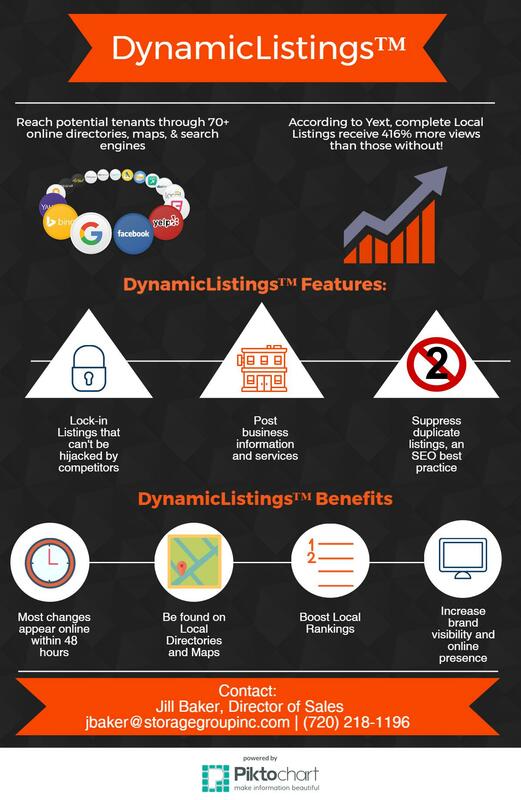 DynamicListings™, TSG’s local listings management tool, helps self storage facilities to improve their local and organic rankings. The local listings experts at The Storage Group can optimize your business listings across 70+ online directories, maps and search engines to boost your facility’s online presence and increase visibility. Local listings management from The Storage Group can protect your business listings from being hijacked by competitors. To see an example of a local listing on Google, check out this blog post from our friends at FusionTech Media. Your facility can improve its online visibility online with a listing on Google Maps. Competitors may attempt to change your facility’s contact information and website URL on the listings and replace the information with their own. DynamicListings™ ensures that this doesn’t happen. Duplicate listings are also suppressed with the DynamicListings™ tool. Local listings may just be the thing that you need to boost your local and organic rankings. An outstanding 72% of our SEO clients have an excellent organic ranking. Be sure to check out our recent SEO and PPC success stories. DynamicListings™ gives your facility the opportunity to let potential tenants know about business hour changes, special offers, photos, staff bios, services, and other business information. Most of these changes will appear online within 48 hours, compared to the lengthy submission and approval process that is required without DynamicListings™. This local listings tool for the self storage industry can give facilities the extra push needed to improve their SEO strategy. Local listings help to create trust and credibility with the search engines, such as Google. If you have any questions or want to learn more information about DynamicListings™, please contact Jill Baker, Director of Sales, at jbaker@storagegroupinc.com or (720) 218-1196.